If you need to cancel your order please contact us within 24 hours of the order been placed by one of the following methods listed below. Then we will cancel the order and make a refund (see refund policy) if any payment has been taken for order. If for any reason you are unhappy if the goods you have ordered and got from Show Winners, we will happily take them. If this is the case please contact us within 14 days from the order been placed. We will happily take back and replace or refund for the good or goods. Please note the good or goods will have to send back to us or be given back to us, if the good is postage you will also be given back in the refund any postage charges, upon gaining a copy of cost for postage. Please contact us by a method listed below to discuss the matter future before sending the good or goods back. If you require a refund on your order, a good or goods we will happily do that. Please contact us to discuss by a method listed below. Card payments will be refunded back on to the card, BACs payment will be refunded back into the bank account the payment was received from. Cheque or cash sales will be refund by cheque. 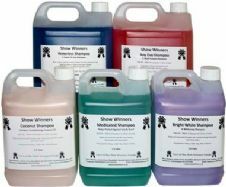 Show Winners products do not contain any allergens that are dangerous for humans and do not contain any dangerous substances.